I had my first artichoke in the 1970s. When the plate was placed in front of me I didn’t have a clue what to do with the green globe with tight pointy leaves in front of me. It was accompanied by a bowl of melted butter and another empty bowl. I stared at the vegetable for awhile. A more mature tablemate, with some culinary savvy, leaned over, took a leaf and showed me how to dip the bottom in butter, scrape the soft base of it with my teeth, and discard the rest of it in the empty bowl. At the time it seemed really odd to throw away so much of the plant. But, that first bite was so good that I got over the unattractive pile of scraped leaves in the waste bowl. There was a real art to eating this flowering vegetable and I wanted to learn how to make it. So, I did. For years I steamed artichokes and ate them with drawn butter. After traveling to Greece and Italy, I discovered a whole new world of artichoke cuisine. They were grilled, pickled, deep fried, and never served with butter. I tried grilling them over a charcoal fire and was left with a dried out, crispy, hot mess. Over the years I realized that grilling artichokes is a two step process that I will outline in the recipe. I have also found that grilling them on the George Foreman Grill helps to keep them from drying out. Artichokes are low in calories and quite high in dietary fiber. Fiber helps to keep us regular and assists in controlling LDL cholesterol levels in the blood. This vegetable, or more correctly a flower bud, is a good source of B vitamins, most notably folic acid that is necessary for synthesis of DNA. It is also a good source of both vitamins K and C. Vitamin C is an important antioxidant that aids in fighting disease causing free radicals. Artichoke is a member of the thistle family of plants that contain silymarin (milk thistle) that aids in detoxifying the liver. In addition, artichokes are rich in minerals, such as copper, iron, and magnesium. These unique buds are nutritionally dense. As mentioned above, grilling artichokes is a two step process, but that shouldn’t discourage you. The end result is worth the effort. This recipe makes a great appetizer, or it can be served as a side dish. Artichokes pair really well with a grilled spatchcocked chicken. There is a good and easy chicken recipe at marthastewart.com. You can make the dipping sauce ahead of time or make it while the artichokes are steaming. 1. Place a large pot on the stove with a metal steaming basket or colander inside. Fill with water just to the bottom of the basket and bring to a boil. 2. Meanwhile, clean and trim your artichokes: Remove some of the tough outer leaves near the stem. With a serrated knife, slice off the top 1/4 of each artichoke. Then, slice most of the stem off. With shears, clip the pointy ends off of the outermost leaves. 3. Cut the artichokes in half lengthwise if they are medium sized. If large, cut into quarters. Scrape out the hairy choke in the center of each section with a spoon. (It is called a choke for a reason). Please note that if your artichokes are going to sit exposed to the air for even one minute you should rub them with lemon juice or place them in a bowl of acidulated water (water with a little lemon or vinegar) to deter oxidation and discoloration. 4. Place the halves or quarters core side down in the steamer basket. Reduce the heat to a simmer. Place a lid on top of the pot and simmer for approximately 20 to 25 minutes until the inside of the artichoke is tender. (check after 20 minutes). Make the dipping sauce while the artichokes are steaming – directions to follow. 5. Remove the basket and let the artichokes come to room temperature so you can handle them comfortably. 1. Heat the Foreman grill to high. 2. Rub the cooled artichoke sections all over with the EVOO, lemon juice, garlic, salt and pepper. 3. Place the artichokes core side down on the grill and close the top. Cook for 10 minutes. 4. Serve with the dipping sauce. This is a dish that does not require utensils. 1. Mix all of the sauce ingredients together in a glass bowl. Feel free to add a little salt and pepper if desired. Cover with plastic wrap and refrigerate until the artichokes are finished grilling. 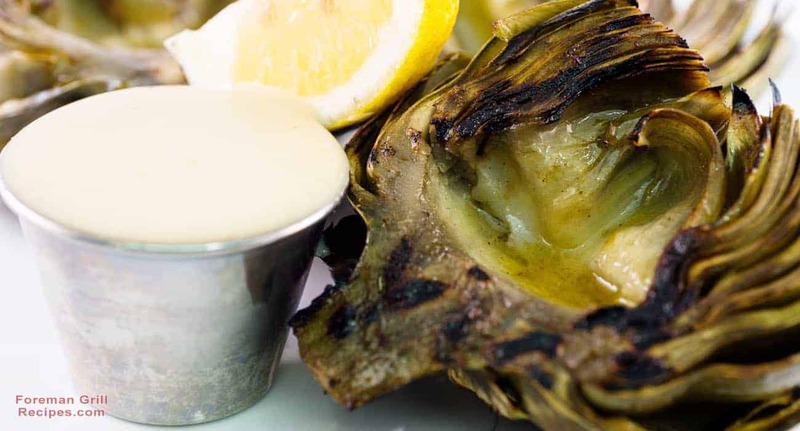 Serve alongside the grilled artichoke sections. Cooked artichokes make excellent leftovers. They can be eaten hot or cold. The leaves make a good and healthy snack. The hearts are delicious marinated and placed on a salad. The hearts can also be used in a stuffing mixture with breadcrumbs and cheese for baked mushroom caps. A super retro dish is artichoke hearts blended with various cheeses, sour cream, and spinach to make a bubbling hot dip served with crunchy toasted baguette slices or tortilla chips. You likely have come across this popular concoction served in a bread bowl.